As a preliminary to the advance of the 75th Division into the hills, the Australian Mounted Division on November 18th forced the enemy from Latron by a flanking movement on the north. The Turks were reported to be evacuating Jerusalem, and Chauvel ordered Barrow with his yeomanry to move rapidly on Bireh and cut off the retreat. Hodgson was to attack the Latron-Amwas position early in the afternoon and. if successful, to push on towards Bireh, on the right of the yeomanry. The 3rd Australian Light Horse Brigade on the left was to endeavour to outflank Latron from the north and north-east while the 4th Brigade made a direct assault. In the distance following the mountains is the road from Latron in the foreground to Amwas. This day's operations served to bring home to all leaders the nature of the task ahead. As Scott with the 9th Regiment on the flank pushed into the hills on his enveloping movement, he came under brisk fire from machine-guns and light artillery. No Turks showed on the dark, harsh hills ahead, but each approach was evidently watched and guarded. For some hours the 8th and 9th Regiments probed fruitlessly at the frowning ramparts. So steep and rocky was the ground that the horses had frequently to be led. After much difficulty, the Notts Battery was brought forward, and was rewarded with a good target on four enemy guns near Amwas; these the gunners silenced at a range of 5,000 yards, and they were next day found by the British infantry. Towards evening, as the result of a striking change in Bulfin's tactics, the 3rd and 4th Brigades were withdrawn. 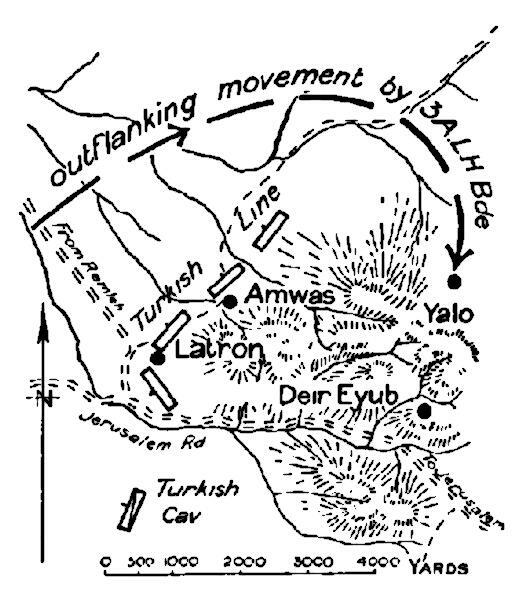 On the left the Yeomanry Division had made indifferent headway towards Bireh. Like the Australians, they found the country impossible for mounted action. Shilta had been occupied, and the troops had advanced within two miles of Beit ur et Tahta (Lower Bethoron); but the batteries of horse artillery had found the old track impossible for wheels. Some of the guns were man-handled for miles, and the Hong Kong and Singapore Battery, mounted on its stalwart camels, climbed almost as far as the advanced troops. In the face of the opposition everywhere met by the Australian and Yeomanry Divisions it was obvious that a mounted advance was impracticable. As of old, Jerusalem, if it was to be won, must be assailed by infantry. 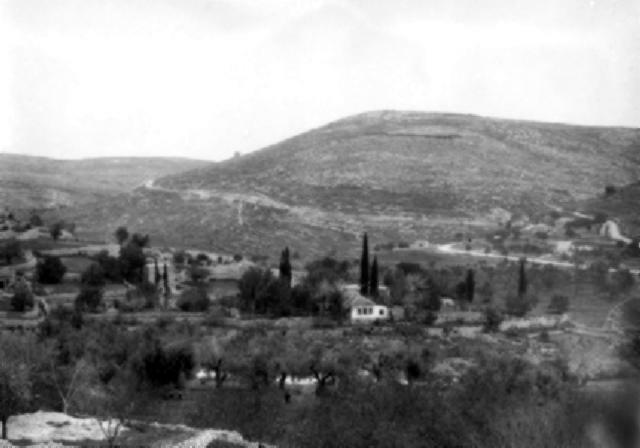 Bulfin decided to attack Latron on the following day with the 75th Division, while the 52nd Division was to strike into the hills by the Beit Likia on its left. The light horse were not to play an active part in the capture of Jerusalem. Yet the advance into the hills by Wilson's brigade on the 18th provided a good example of the effect of that sort of enveloping movement which can he made only by mounted troops, even though it is not at the time attended by material results. A patrol o€ Scott's advanced troops under Sergeant G. G. Masson had penetrated as far as Yalo a native village about five miles almost due east of Amwas. Next morning, when the 75th Division moved on Latron, they found the position evacuated; the Turks, fearing that isolation and capture would follow the thrust to Yalo, had abandoned strongly-held ground, and the men of the 75th were saved severe fighting and heavy casualties. Extracted from H.S. Gullett (1944) The Australian Imperial Force in Sinai and Palestine, Sydney: Angus & Robertson, pp. 489 - 491.